But are we really any safer? I would have preferred a direct flight. But on my vacation several weeks ago, the cheapest flight to Barcelona, Spain, required a two-day layover in Helsinki. I had never been, never wanted to go and likely never would have gone to Finland. I hate the cold. But I’m glad I did.In a world of Nordic blue-eyed blondes is a criminal justice system that the Finnish boast as having one of the three lowest recidivism rates in the world. The Chicago Reporter’s website will receive a much-needed facelift this year with a generous grant from the Open Society Foundations. Staff has begun testing the site, and the public launch could happen late fall or early winter as we continue to celebrate our 40th anniversary year of investigating race and poverty. The goal of the project is to improve the look and feel of the website but, more importantly, how the website operates. It will be easier to find data, videos and stories, relate to those writing them, and communicate with the Reporter community. There will be more things to look at. It’s been a brutal summer. I’m not just talking about the record-breaking heat that fell on us a few days at a time but had us complaining like we had been living in a humidifier all summer.We were reminded of the brutal summer every time we picked up a paper and the headline read: “Another youth …”You know how the story went. More youth have been dying in Chicago because of violence than in any other city in our country. These crimes bring up images of guns and chalk-lined streets. But rarely do you envision the crime scene being a bedroom or some other safe haven in people’s homes.But that’s the story flying under the radar.In this month’s investigation, “Toying with danger,” Reporter María Inés Zamudio uncovered that, while the state’s homicide rate has dropped 26 percent in the past decade, the number of children who were killed after the Illinois Department of Children and Family Services investigated their cases for abuse or neglect has remained stubbornly unchanged.Something has to be done about this. Happy anniversary. 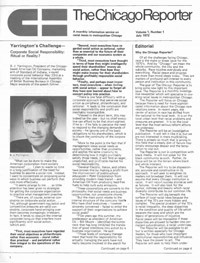 It was in July 1972 that The Chicago Reporter debuted its first issue. Since then, the magazine has continued to grow and impact policy issues both on a local and national level. More than 700 staff and interns have walked through our doors during that time. And during the next year, we’ll look back at where we’ve been, celebrate our impact and look forward to the years ahead. For people not math averse, here’s a little question for you: If I own a two-flat and I have no tenants, what do I collect in rent?Your immediate answer would be “zero,” right? I would say that, too. But apparently that’s not the case when it comes to public tax dollars being funneled through the U.S. Department of Housing and Urban Development to the Chicago Housing Authority.Properties on prime Chicago real estate along the Chicago River are sitting vacant while thousands of needy people sit idle on the CHA’s wait list.How does this happen during a time when our nation is facing some of the highest unemployment rates and record foreclosures, and 40,000 people are waiting for an apartment from the CHA?Angela Caputo explains in this month’s cover story, “Home evasion.” In her investigation, Caputo found that the CHA had taken a good portion of its housing stock “offline” without following protocol for approval, which is spelled out in written HUD rules.The problem is this: The CHA is continuing to receive HUD money for each of these units, even though they’re empty and have been for years.How much? Millions.Officials maintain that the CHA is allowed to continue to collect the funds on these units.I don’t know what it’s like to be homeless and living on the street or moving from one relative’s home to another because you don’t have a permanent place of your own. But I can imagine that it’s got to be frustrating watching good homes go to waste.I see the glut of residential foreclosures—beautiful properties—falling apart from neglect or being left abandoned when the struggling homeowners could have remained in them. Florida’s Trayvon Martin case taught us a lot of things. But among the lessons learned is that police accountability is not only a Windy City issue. In Chicago, I would argue that the lack of accountability with rogue officers has left residents of high-crime neighborhoods distrustful of the police accountability system, which allows abusive officers to keep their jobs with little discipline. Distrustful residents won’t help police solve cases, and it’s difficult for police to solve cases without helpful residents. In the end, high-crime neighborhoods remain dangerous, and the millions of dollars that could have been spent to quell crime are used as damage payments in these police misconduct cases instead. Nobody likes to get stiffed—especially when it comes to their paycheck. Wage theft is so prevalent in our society these days as companies look for ways to produce goods and services at a fraction of what it cost five and 10 years ago. It’s not always blatant, often subtle and pernicious—unpaid overtime, unpaid vacation, less money in the paycheck. But the victim is clear: the worker. There are many ways that people are getting shorted from what’s owed to them at a time in our history when people need their money the most. It’s a new year with new resolutions. And I’ve got some for local and federal housing authorities. In 2012, the U.S. Department of Housing and Urban Development should resolve to be courageous and slow the money that flows to landlords running an arsenal of dilapidated housing stock for Chicago’s low-income residents. HUD should stop lining the pockets of irresponsible landlords and instead force those property owners to clean up their acts or sell their buildings to responsible managers who will reinvest that money to make these buildings truly habitable. Subsidized housing under Section 8 of the federal housing act is something people rarely talk about. I love flowers. I’ve always loved flowers. Let me lay out in a field of daisies all day, and I’m content. So it wasn’t too surprising that when I was about 8 years old, I grabbed a plastic flower as my mother walked my sister and me down the aisle at a crafts store. It wasn’t until we were in the parking lot loading the trunk that my mother noticed the unpaid flower still in my hand. Perhaps if more minorities got state contracts, there would be fewer minorities out of work. That’s a stretch, but perhaps it’s partly true. In The Chicago Reporter’s current cover story “Empty jackpot,” reporter Megan Cottrell tallied how many businesses benefitted from a state program that grants contracts to businesses owned by minorities, women and people with a disability. The state pats itself on the back for reaching its overall goal, 20 percent. I give the state credit for having a goal—many states don’t, Cottrell found.